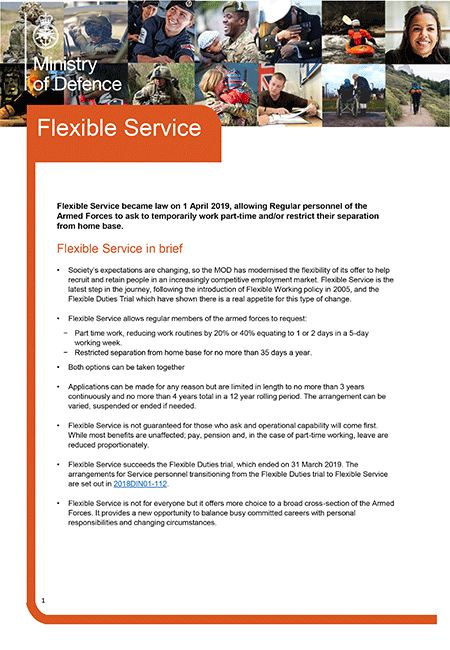 Flexible Service became law on 1 April 2019, allowing Regular personnel of the Armed Forces to ask to temporarily work part-time and/or restrict their separation from home base. Society’s expectations are changing, so the MOD has modernised the flexibility of its offer to help recruit and retain people in an increasingly competitive employment market. Flexible Service is the latest step in the journey, following the introduction of Flexible Working policy in 2005, and the Flexible Duties Trial which have shown there is a real appetite for this type of change. − Part time work, reducing work routines by 20% or 40% equating to 1 or 2 days in a 5-day working week. − Restricted separation from home base for no more than 35 days a year. • Applications can be made for any reason but are limited in length to no more than 3 years continuously and no more than 4 years total in a 12 year rolling period. The arrangement can be varied, suspended or ended if needed. • Flexible Service is not guaranteed for those who ask and operational capability will come first. While most benefits are unaffected; pay, pension and, in the case of part-time working, leave are reduced proportionately. • Flexible Service succeeds the Flexible Duties trial, which ended on 31 March 2019. The arrangements for Service personnel transitioning from the Flexible Duties trial to Flexible Service are set out in 2018DIN01-112. • Flexible Service is not for everyone but it offers more choice to a broad cross-section of the Armed Forces. It provides a new opportunity to balance busy committed careers with personal responsibilities and changing circumstances.